Sam has been teaching and performing music in the C-U area since 2005. 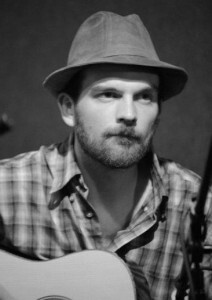 He is well versed in a variety of musical styles including rock, blues, folk, funk, bluegrass, old-time, and jazz. Sam believes that with ambition to learn and the guidance of a good teacher, everyone has the ability to cultivate excellent musicianship. He studied music at Parkland College and has taken private instruction from some of the most highly esteemed musicians in the region and in the country. In both 2011 and 2012, Sam won 2nd place in the flatpicking guitar contest at the rockygrass bluegrass festival in Lyons, CO.
On Monday nights at the Rosebowl Tavern, Sam hosts the Urbana Hootenanny, a community open stage for acoustic musicians. You can also find him performing around town with the Corn Desert Ramblers, Black Coffee Fridays, and Euphor.